AN immigrant who allegedly attempted to use a forged university certificate to stay in the UK has been arrested. SOLIHULL Council have been stuck with a million pound bill on services for unaccompanied children seeking asylum. BORDER officials at Birmingham Airport have shown off some of the counterfeit items they’ve seized in the last few weeks. SOLIHULL is appealing for more people to foster and adopt children, which would ensure youngsters don’t have to be sent outside the local authority. On page 5 of your last issue you listed the ‘magnificent seven from Solihull’ who had received awards in the Queen’s Birthday Honours list. 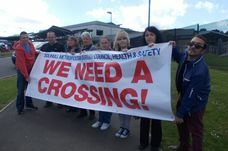 THE cost of caring for young asylum seekers is heaping fresh financial pressure on Solihull Council. A PROTEST against radical cuts to services supporting child asylum seekers has taken place outside the UK Border Agency’s offices in Solihull. Nearly 150 vehicles were stopped and inspected in a multi-agency road check operation which was carried out on Monday 23 August, the third operation of its kind since June 2010. SOLIHULL welcomed the government’s Border and Immigration Minister Phil Woolas on Wednesday (February 17) when he met the joint UK Border Agency and police team. A shopworker has been jailed for 12 months after smuggling almost £20,000 worth of cannabis through Birmingham International Airport. A MAN who hid a passport in his underpants is one of several overseas visitors who have tried to con their way past officials at Birmingham Airport. A NIGERIAN man has been given a six-year prison sentence for attempting to smuggle £45,000 worth of cocaine through Birmingham International Airport. A MAN from Essex has been charged with attempting to smuggle 14 kilos of cannabis through Birmingham International Airport. CUSTOMS officers have a new weapon in their fight against drug smuggling.